Ex-Spaceseed wordsmith/gizmoist Serson Brannen explores the outer limits of high tech spoken word space art on Recalibrated, and as the new high priest of the temple of cosmic slam poetry he fills a void that's been sadly vacant since the heady acid daze of Robert Calvert, Daevid Allen, and Gilli Smyth. Reminiscent in some ways of Nik Turner's Xitintotoday (though without the Egyptian mythos) and Mother Gong's more overtly poetic forays into spiritualized psychedelic rock speak, Recalibrated often sounds like Jack Kerouac teleported to the 21st Century and loaded into a Macintosh. Brannen's verbal gymnastics, especially on pieces like "The Lone Gunman Theory" and "Seduction," mix conspiracy theory and alien abduction with inner visions of the apocalypse to come. Accompanied by theremin, an assortment of processors, and some occasional synthesizer and synthetic percussion, Brannen conducts hypnotic séances that at times morph into electronic ragas for Shivas of the cyber age. This is especially the case on "Alabama Meltdown," the most innervating of the nine tracks on Recalibrated. Primal electronic rhythms from the silicon jungle power Brannen's demonic rantchant through the secret history of an alien invasion on American soil. It's a harrowing 12-minute mini-epic through a surreal alternate reality that's guaranteed to put you into a soild-state trance without having to resort to any of your favorite psychoactive chemicals. One can only imagine what a live Subliminator gig must be like, but if Recalibrated is any indication, it must be a real space owwwwwwtttttt! 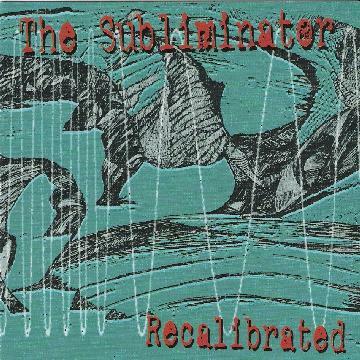 For more information you can visit The Subliminator web site at: http://www.thesubliminator.com. Visit the Scared Records web site at: http://www.scaredrecords.com.